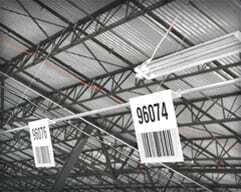 The premium warehouse striping solution is ASG Services world renowned embedded striping. 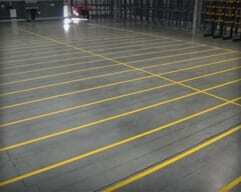 The premium warehouse striping solution is ASG Services world renowned embedded striping. A channel is created in the concrete floor surface, removing around ⅛ of an inch and to a predetermined width, typically 4 inches. Our installation teams then fill this channel with a high build epoxy compound to create the most durable form of warehouse striping we are aware of. Advanced equipment utilized by ASG Services is fitted with rows of diamond cutting blades for high precision preparation. This Durable floor striping is not widely known and as yet, ASG Services are unaware of any other company performing this installation is the USA. The reason for this level of preparation is to prevent material handling equipment from striking the edge of the epoxy paint. 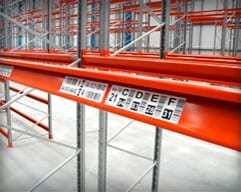 Most paint and tapes are applied to the surface which means the forklift truck hits the edge and rides up onto the line. The forces exerted are far too great for paint or tapes to withstand the pressure, which is why painted floor striping and floor tapes wear and/or fail. Placing the paint below the surface prevents this, the forklift trucks ride onto the line without applying any sheer force. 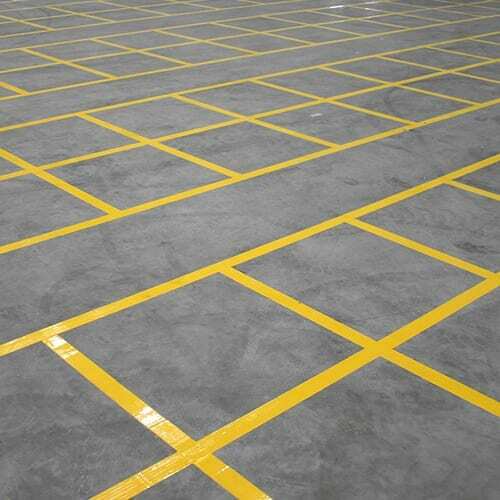 Embedded floor striping is the most durable method of warehouse striping we know of, it takes longer to apply than any other and costs more, however it should be seen as an investment. Once complete, our customers do not have to recoat every month, or once a year, therefore saving money in ongoing maintenance. 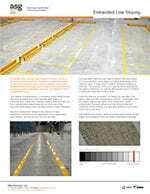 Due to the overall cost, we advice customers to consider this option for their most high traffic areas, which results in a cost effective but high performance installation. 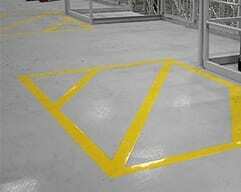 We ask all customers to thoroughly clean their warehouse and distribution center floors before we arrive to install any floor striping. 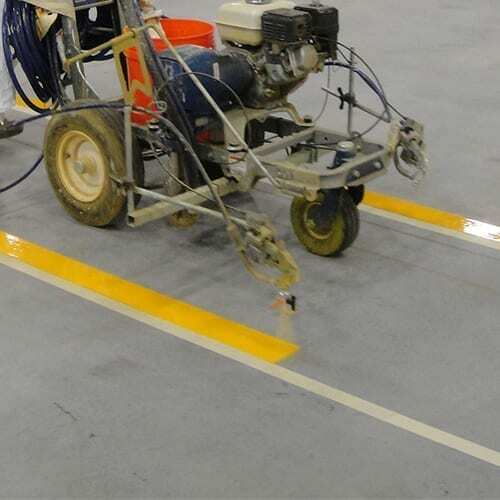 Embedded floor striping requires the use of masking tape, therefore the unprepared areas need to be clean enough for tape to stick. ASG Services works closer than ever with customers choosing this option as we appreciate that downtime costs money. 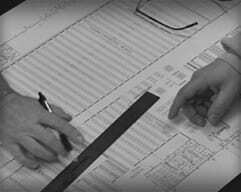 We will present schedules to help fit with your operation and which help our installation teams achieve their deadlines. 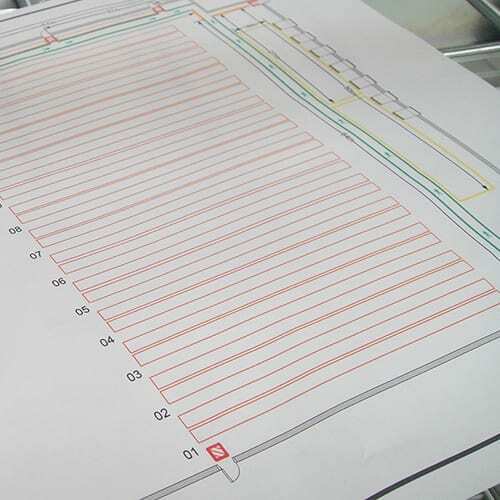 All of our installation teams are fully trained and experienced in this advanced installation process, which is critical for a successful application. All are fully insured to work on any customer site throughout the US and beyond. 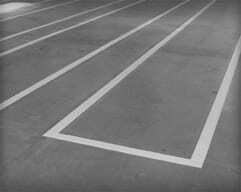 Multi site projects are normal for ASG, keeping our teams out on embedded striping on a daily basis. We answer questions everyday, so feel free to call (877) 447-9798 and discuss your situation and find answers to help with your project. If you prefer to send an email, please do and include an images or drawings to help us with our response. Unprepared floor striping is a term given to epoxy paint which is applied to the floor without any concrete preparation taking place. The preparation method used, of removing the concrete surface using a shot blast machine, combined with an epoxy resin compound or similar applied, is the most cost effective high performing solution available. OSHA Floor Striping Standards… do not exist.